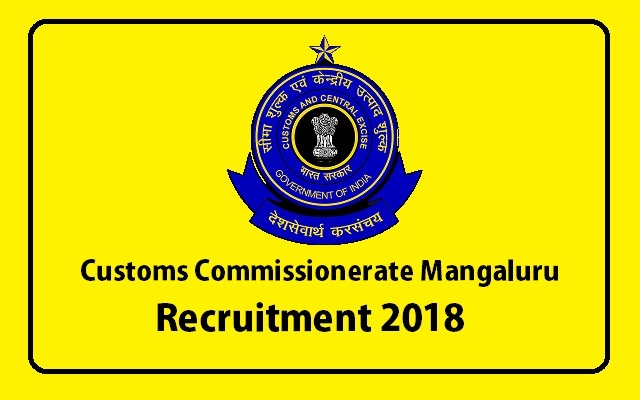 Mangalore Customs Commissionerate Recruitment 2018 -2019, 36 Tindel, Senior Deckhand, Seaman, Greaser Posts Download Application through Official website www.customsmangalore.gov.in. The last date for submission of applications is 03.02.2018. Mangalore Customs pattern of examination, Mangalore Customs Syllabus, Mangalore Customs Question Paper, Mangalore Customs Admit Date Release Date, Mangalore Customs Exam Date, Mangalore Customs Result Date Given Below. Customs Commissionerate Recruitment 2018-36 Seaman, Greaser Apply Online. Tindel - Essential : (i) Eight standard pass. (ii) 10 years service on sea going vessel with 5 years experience in independent handling of mechanized craft fitted with auxiliary sails. Desirable : (i) Certificate of Competency for Inland Master 1st class or (ii) Certificate of Service. (iii) Matriculation or equivalent. Senior Deckhand - Essential: (i) Eight standard pass. (ii) 5 years service on sea going vessel with two years in helmsman and seamanship work. Desirable : (i) Certificate of Fishery Training School. (ii) Matriculation or equivalent. Seaman - Essential : (i) X class pass or equivalent. (ii) Three years experience in sea going mechanized vessel with two years in helmsman and seamanship work. Desirable : (i) Certificate of Competency as 'Mate of fishing vessel' issued by Marine Mercantile Department. Greaser - Essential : (iii) X Class pass or equivalent. (iv) Three years experience in sea going mechanized vessel on main and auxiliary machinery maintenance. Desirable : (ii) Certificate of Competency as 'Engine Driver of fishing vessel' issued by Marine Mercantile Department. Hard Copies of the signed application (registered online) along with photocopies of (i) ID proof (ii) Proof of Date of Birth (iii) Educational Certificates: Mark-Sheets/Degree Certificate (iv) Caste and attested copies of relevant documents should be addressed to “Additional Commissioner of Customs ( Preventive) , New Custom House, Panambur, Mangalore-575010”.